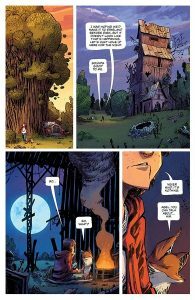 Young in Middlewest has crafted such a down to earth fantasy tale, that it feels instantly familiar yet new and exciting all at the same time. Abel is carrying on his journey to find answers and a healer with a fox. Out of this duo whilst there are humorous moments; there are some earnest genuine conversations had about parent-child relationships that perfectly capture a child’s inner turmoil and the questions that arise. A good portion of the comic is following Abel’s father and Young’s propensity to know when dialogue is required or when to just let the art do the talking allows you to start to understand and maybe even want the dad to do well which is not something I thought would occur after the first issue; but Young’s script and Corona’s art do such a good job of bringing depth to what could be a shallow character. The rest of the issue finds Abel and fox caught in conflict with a fantasy character who is a fan of bridges; the sequence is packed with charm and tension resulting in an inventive solution. The world Young has created much like his other creator-owned works feels alive and begs to be read further; this has just the right mix of heart, whimsy and adventure. Corona’s art paired with Beaulieu’s colours is a wonder as it evokes the tone Young sets out flawlessly. This sort of Bridge to Terabithia-esque world where you could almost believe it was a kid’s imagination putting these fantasy elements into the real world; as the splotches and slight unruliness of the inks and pencils keeps the art grounded amongst the more outlandish elements. Middlewest is a delight to read; with fun, nuance and a talking fox. Young and team have made a comic that deserves to bought and will be enjoyed.